Pushing the boundaries of what we'd all thought possible in a first person shooter only a few years ago, Bohemia Interactive preps their next title for launch 29 June 2010 worldwide. 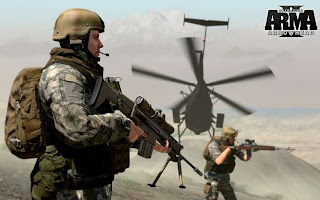 Called ArmA 2: Operation Arrowhead, this ground breaking new PC games’ campaign enables players to engage the enemy as members of the United States Army in a fictional region of west Asia named Takistan, where the terrain is based loosely on Afghanistan. Operation Arrowhead will include three massive maps (you think Battlefield has BIG maps - think again! ), a variety of new units, vehicles and equipment along with a full single player/coop campaign. Among the new units are a wide array of US Army personal and vehicles, Czech forces, UN peacekeepers and German KSK units. Some awesome new features are included in this coming standalone game title (which can also be merged with the original ArmA 2 for addition content). You can check out an in game video showing off NaturalPoint's TrackIR being used whilst piloting the AH-64 Apache gunship and also check out the full Operation Arrowhead teaser video. NaturalPoint TrackIR 5 Ultra headtracker. CH Products Multi Function Panel for easy keystroke emulation. When I'm flying in game, I swear by my Topgun pack. You will too! PC gaming is dead huh??? Well, as I'm sure you're all aware - PC GAMING IS NOT ALLOWED TO DIE WITHOUT PERMISSION - and I've not given any permission along those lines at all... And it doesn't look like any software developers have either! There are lots of great PC platform only titles due out in 2010, so get ready resellers!!! Newsletter 30th June Free USB 3.0! Armor A90 arrives in Australia! Jing cooling fan from Thermaltake!